Nvidia originally put together a Battlebox PC system accreditation program back in 2013. At the time the stated goal was to help create "a new breed of gaming machine" capable of 4K gaming. Then in 2015 it reignited this high end PC gaming certification program with select system integrators. Today Nvidia has announced that it is introducing a new generation of Battlebox PCs that has been formulated with the help of top system builders and pro gamers. It looks more accessible than before (not only top-end) and there will be two Battlebox categories going forward; the GeForce GTX Battlebox Ultimate PCs, and GeForce GTX Battlebox Essential PCs. According to Nvidia's official blurb the new Battlebox specifications "give people everything required to upgrade their gaming experience: the best GPUs, CPUs, Memory, and screens all designed to work seamlessly for the smoothest, easiest PC experience ever." This time around the high end gaming aspirations of the Battlebox is covered by the GeForce GTX Battlebox Ultimate. Such a setup will "bring you an incredible experience – every time," insists Nvidia. It covers all the gaming activities that are popular today such as modern AAA DX12 FPS games, eSports pro gamers, 4K gaming, and is of course VR Ready. For the GeForce GTX Battlebox Essential PCs we predictably move down the hardware ladder a rung or two. Nvidia describes these PCs as being adept at "today’s top games like Overwatch and League Of Legends," where they will always put in a slick performance, delivering 1080p at 60 frames per second or better. You can head on over to the new Battlebox pages to find out the PC making partners working with Nvidia in your country, territory or world region. 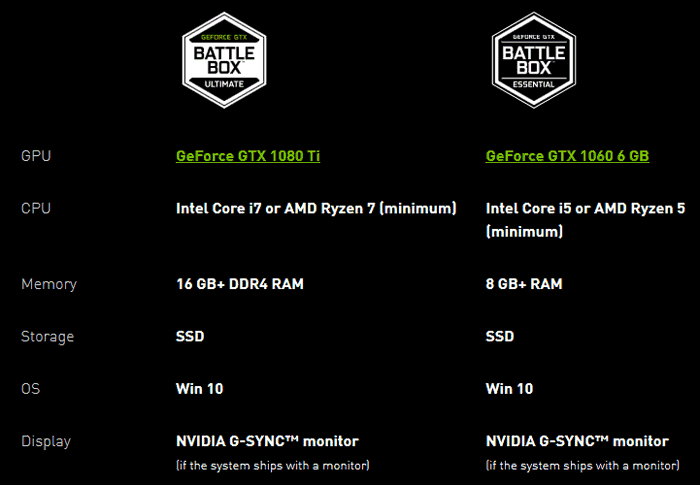 Above are the minimum GeForce GTX Battlebox specs for both the Ultimate and Essential versions. What's the point? Consumers who don't know their way around hardware won't know who NVidia is, or why the Battlebox standards are important, so they most likely won't be swayed just by this little sticker. And people who do know their stuff will be looking at the specs of the system and making their own judgement anyway. Just a ploy to get NVidia into more OEM machines by tempting them with more marketing tools? No SSD performance? There are some seriously slow SSDs around. No RAM speed? Kinda important for Ryzen. No PSU quality requirement? That's where they save the most bucks by using trash. No Sound or peripheral requirements? They might as well ship them with no sound card and a ball mouse. I know some points I'm picking on might seem unimportant, but I would expect a big company like Nvidia to be a bit more specific when doing something like this. The only thing that would explain it is if things change as time goes on, otherwise this is a very strange move indeed.